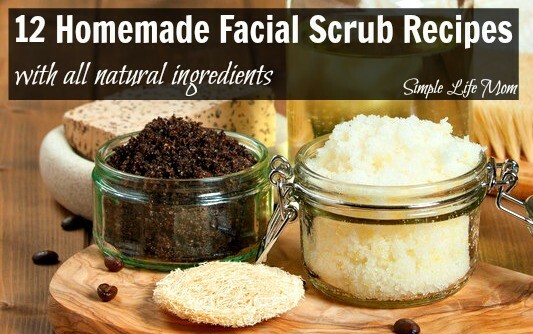 These 12 Homemade Facial Scrubs make great gifts. Beyond that, these scrubs are tremendous for your skin; helping with acne. Scrubs are smoothing, anti-aging due to the exfoliating and essential oils, and are very refreshing. As with all things containing herbs or essential oils, please test on small amount of skin first to make sure your do not have an allergic reaction. 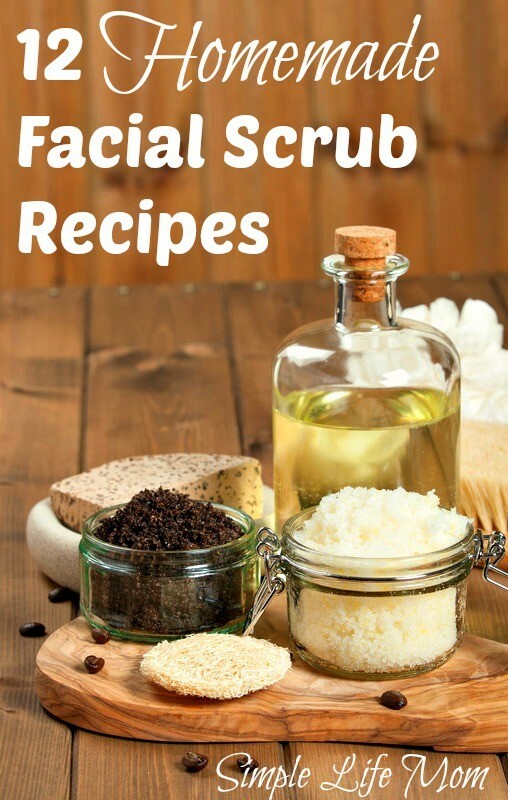 This recipe will make one ounce, enough to make fresh each time you desire to give yourself a facial scrub. Save any peelings from oranges, lemons, limes, or grapefruits that you use. Dry the peels and grind them in a food processor. Save them for this recipe. Mix all ingredients and stir until smooth. Massage into damp skin and rinse well with warm water. Pat skin dry. Mix the ingredients together and store in a glass jar. To use, place 1 Tbsp in your hand and massage onto your face. 1 tsp homemade vanilla extract or scrape seeds from 1 vanilla bean. This oat scrub leaves your skin feeling smooth and clean, without being as abrasive as salt or sugar scrubs. Feel free to grind the oats are leave them steel cut. Mix it together, massage it into your face and rinse well. This makes just enough for one use. This is a great scrub to do occasionally. Do not do it too often as it may be too abrasive. Mix together and massage into face. Cut one fresh tomato in quarters. Take a piece and dip it in the sugar, gently rub it in circular motions onto your clean face and neck; avoid the eye area. Next, massage a tomato part without sugar in a circular motion onto your face to cover your skin with tomato juice. Let it dry for a few minutes and then rinse your skin with fresh cool water; pat your skin dry with a clean towel. Mix together and rub onto your face in circles with your finger tips. These all look great and readily available ingredients too! Yes, I’m so glad there’s so many natural, effective ways to rejuvenate our skin. Yummy! With the dry winter season approaching these would make great gift ideas!! Yea! Do you have any other ideas? Excellent blog! I am an Esthetician, and love natural skincare…thanks for sharing! Thank you!! I look forward to reading your posts!! I love your site, excellent ideas on facial, hair, laundry soaps and scrubs… Sign me up for the newsletters. Hi I was wondering how long the lemon sugar scrub lasts? It lasts as long as the oil stays fresh, so that will vary depending on which oil you use. Some oils become rancid more quickly (olive) while others last much longer (jojoba). I love all these recipes! I’m wondering if a preservative should be used. They won’t last as long, but they are fine without preservatives if kept sterile.